A poor Texas cowboy, a wealthy Mexican socialite, a whirlwind romance, and a secret marriage: the ingredients of a perfect love story, but for Redigo and Marianna they mean nothing but trouble. Marianna's father is determined to tear the lovers apart and devises a well-organized plan of deceit and lies to remove John Redigo from his daughter's life. His plan succeeds, and Redigo and Marianna are torn asunder. For years they lead separate lives. It's during these years that Redigo meets Addie Murphy. They both work on the Lazy M Ranch and have been friends for years but finally realize their feelings for one another are much deeper than just friendship. They discover love is good in the later years of life.Wonderful and Redigo and Addie look forward to growing older together. That dream becomes clouded when Redigo's daughter from his brief marriage to Marianna comes into his life. Now twenty-five years later, an older and hopefully wiser man has to decide if he will risk life and limb to rescue the love of his youth from the man now trying to take her life and steal her fortune. 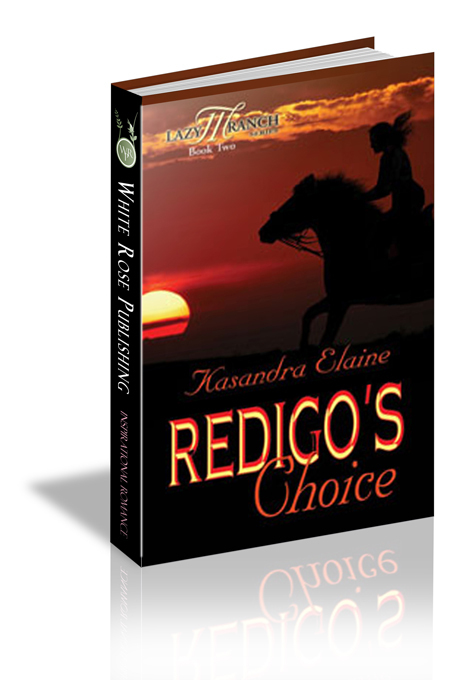 Does Redigo rescue the lady and rekindle the love of his youth or does he realize the last love is the best love? He continued to talk but lowered his voice. "I told them from now on to move him to the corral before they start makin' a lot of commotion in the barn. These horses are country music fans. That rock music upset Patches. If they'd play a little George Strait, it would calm the horses." Addie put her hands on the stall door. Redigo admired them. For all the housework she did her hands were soft. "Old man, do you like any kind of music besides country?" Redigo grinned. "There's another type of music?" Addie nodded. "Yeah, a couple of other types." "I think we can go now." Redigo cupped her elbow, and Addie fell in step beside him. "So what kind of music do you like?" She laughed. "You'll think I'm really old fashioned. I like country, but I prefer the older country like Eddy Arnold, Jim Reeves, Marty Robbins. I love southern gospel, I like the big bands. Then there's Bing Crosby, Dean Martin, and Frank Sinatra. I like lots of kinds of music." Smiling Redigo asked. "Do you think I'd be forward if I asked you to come to my quarters?" "I want to show you my music collection." Redigo grinned. "Is that anything like when a man used to ask a girl to his apartment to show her his etchings?" Redigo wiggled his eyebrows at her. "Might be. You brave enough to find out?" Addie's cheeks turned red. "I'm brave enough."